Now, the natural and cultural significance of this unique place has been recognized as a UNESCO World Heritage Site. News of the monumental designation came on June 29 during the UNESCO World Heritage Convention in St. Petersburg, Russia. Since 1972, the Convention has endeavoured to protect the world’s cultural and natural heritage by identifying places that have outstanding universal value and adding them to the World Heritage List. 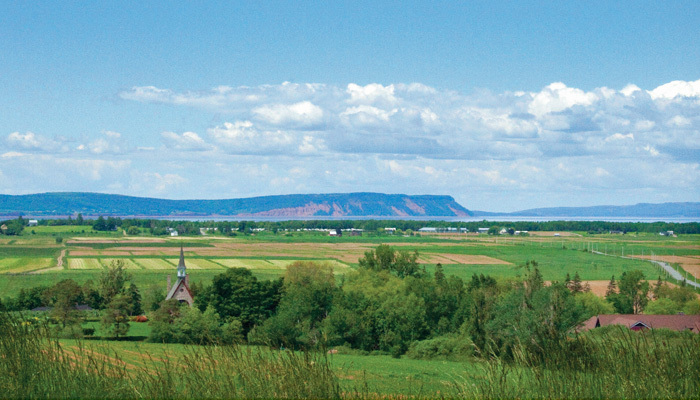 French for “large meadow”, Grand Pré’s proximity to the ocean and the Bay of Fundy’s powerful tides meant that the area was mostly marshlands when Pierre Melanson dit La Verdure founded the community around 1680. Using a system of dykes to hold back the tides, Melanson and 500 original settlers were able to turn the marshlands into pastures that their animals could graze and fields where their crops could thrive. Despite British rule over the colony, which would become known as Nova Scotia, Grand Pré had become a large and vibrant community by the mid-18th century. This prosperity, however, came to an end in 1744 when the English and French once again declared war. Unwilling to let the Acadians continue farming some of the richest land in the province and determined to make Nova Scotia more appealing to British settlers, the English forcibly expelled the Acadians from their communities and dispersed them to British colonies from Massachusetts to Georgia. These deportations lasted from 1755 until 1763 and when they ended, more than 10,000 Acadians had been displaced. In the years following, the injustice suffered by the Acadians was largely ignored and, eventually, forgotten by most. Not so for the Acadian people who, despite the odds, found ways to preserve their language and culture. Over time, the efforts of individuals like John Frederic Herbin and organizations like the Dominion Atlantic Railway and the Société National l’Assomption, saw Grand Pré restored. The erection of memorial monuments and the construction of a commemorative church helped return the community to its roots and following its acquisition by the government of Canada, Grand Pré was declared a national historic site in 1961. Today, the property’s 1,323 hectares of intact dykelands are not only an unparalleled example of human interaction with a distinct environment, but also a symbol of hope, perseverance and pride. Cultivated and nurtured by its original settlers, the land continues to grow and thrive; in turn helping to re-build and strengthen a culture that could have been so easily lost. 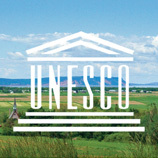 For more information about the designation of Grand Pré as a UNESCO World Heritage Site, visit the Nomination Grand Pré website. For details about the Department of Communities, Culture and Heritage’s support of Nomination Grand Pré, see the official press release. To plan a visit to Grand Pré, visit the Société Promotion Grand Pré website. Since 1972, the UNESCO World Heritage Convention has endeavoured to protect the world’s cultural and natural heritage by identifying places that have outstanding universal value.